Do you feel you'll never understand why your sweet little kitten sometimes turns into the cat from hell? Twisted Whiskers helps owners understand the reason behind the behavior and how to correct it permanently using step-by-step behavior modification techniques. This book will help cat owners regain the loving relationship they've always wanted with their cat. For new cat owners, this book is a must. "Johnson's cat-friendly, no-nonsense techniques glow with common sense and insight. 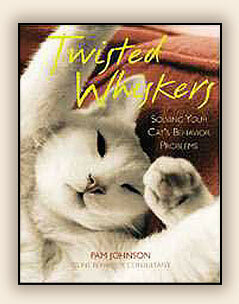 Twisted Whiskers is both a practical guide and an inspiration." As a Feline Behaviorist, Pam Johnson-Bennett has appeared on numerous television and radio shows, written articles for the top cat publications, and has been profiled nationally in magazines and newspapers. She works on a referral basis by veterinarians. Her housecalls cover everything from routine training problems to the most eccentric feline behavior. In Nashville, she can be heard on WKDA-AM, hosting her weekly radio show, "The Pet Hour." Her first book, Cat Love, was inducted into the Cat Fancy Hall of Fame. Her second book, Twisted Whiskers, was honored with the Cat Fancy Editor's Choice Award and received the Cat Writers' Association Certificate of Excellence. Her third book is the best-selling Psycho Kitty?. She has also authored Hiss and Tell: True Stories from the files of a Cat Shrink and Cat vs. Cat. Pam lives in Nashville with her husband, four cats, and a dog.